Whatever your need, Datacolor offers options. Choose self-directed training or guided by one of our Industry experts, one-on-one or classroom style, on-line or in-person, at your location or ours, pre-designed and structured or customized just for you. Learn more about color technology with our library of tutorial videos, quick reference guides and articles. Join us in one of our traveling color seminars or webinars or use our flexible options for remote web training or advanced consulting services. Color Seminars: Classroom style lecture and demonstration covering useful color topics in select venues around the globe. Click for a location near you. Learn the fundamentals of colorimetry and gain practical understanding of best practices for visual and instrumental color evaluation and communication. 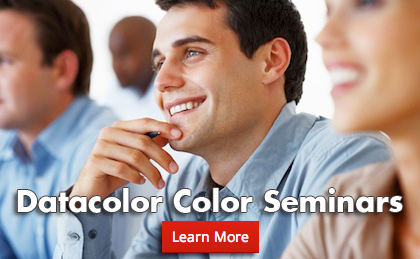 Designed for anyone involved in the color supply or decision chain, this introductory seminar requires no experience of use of specific color technology products. Click here for more information. User Courses: Regularly-scheduled, hands-on product training at our corporate headquarters near Princeton, NJ. Each class is limited to no more than six students, each working on a dedicated system. On-site Training: In person at your location, let Datacolor come to you. One-on-one or group time with a Datacolor Application Specialist – for training, review or in-depth process consulting. Any of Datacolor’s regular courses or training classes can be customized specifically to your goals. Live via remote conference, expert training without the expense of travel. Remote-desktop versions of Datacolor hands-on courses – or customized product training — delivered to your PC. Webinars: Regularly scheduled, short, web-seminars delivered live by Datacolor Specialists. Designed to give busy color professionals best practices and tips to make more confident color decisions, each schedule-friendly session is only 30 minutes – plus 15 minutes live Q&A with the color experts at Datacolor. Check out our upcoming FREE webinar series here. Articles: Browse our archive of selected white papers, reprints, reports and discussions. License ValidationClick here for Datacolor's Software License validation service. Teamviewer SoftwareClick here to download the full version of TeamViewer. Datacolor utilizes TeamViewer for customer support.